To appreciate why houses should be orientated in a particular direction, it is important to understand the seasonal and daily changes in energy flow. When we see the Sun’s position changing in the sky it is of course the Earth that is moving, not the Sun. While recognising this, for convenience, in this information file we will refer to it as the Sun’s 'movement'. By appreciating how the Sun’s movement throughout the day varies from season to season, we can predict the performance of solar equipment and buildings. We will know when the Sun is shining on them and for how long. The seasonal variation in the times of sunrise and sunset, and the variation in the Sun’s altitude are caused by the Earth’s axis being tilted at an angle to the plane of its rotation around the Sun. In Figure 1, we see that the Earth’s axis of rotation is tilted (inclined at 23.5 degrees) to its plane of revolution around the Sun, and constantly points to one direction in space. Figure 1 The number of hours of daylight varies as the Earth revolves around the Sun. In December, the southern hemisphere of the Earth has longer days than the northern hemisphere. In June, the reverse occurs, with the days being shorter in the southern hemisphere. The Earth’s axis is still tilted at 23.5 degrees in September and March, so both the northern and southern hemispheres have the same length of day. The angle of the Sun above the horizon at a given time of day will also vary throughout the year. At noon on December 21 (the summer solstice), the Sun’s altitude at Perth will be 81.5 degrees, or almost directly overhead. It also shows that at noon on June 21 (the winter solstice), the Sun’s altitude at Perth will be 34.5 degrees or shining more directly into our face than the top of our head. Figure 2 also shows the position of the Sun on March 21 and September 21 (autumn and spring equinoxes), when the maximum altitude of the Sun will be 58.5 degrees in Perth. The seasonal variation in the point on the horizon at which the Sun rises and sets are generally less understood or appreciated. 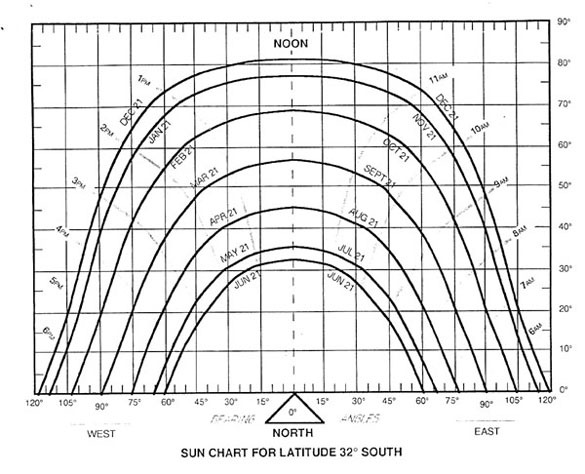 From the Sun Angle Chart (Figure 2), we can see that the Sun only rises in the east and sets in the west at the spring and autumn equinoxes. From March to September, it will rise and set to the north of the east-west line and from September to March is will rise and set to the south of the east-west line. The chart is for the latitude of Perth (32 degrees South). The details of this chart will vary with latitude and it is necessary to have a different chart for each 4 degrees change in latitude. The Sun angle chart is a particularly powerful diagram as it provides most of the information required for orientating solar equipment. Figure 2 The Sun Angle Chart. Note that the times are in local solar time. Figure 3 The Sun angle chart can be used to find when a particular site has clear solar access. To use the Sun angle chart, simply stand at the point at which you intend to place the solar equipment and take the bearing of objects that may cast shade on the site. The bearing can be measured accurately with a compass and a theodolite. Sun Angles are used to determine the best orientation for houses and other buildings so that they make the best use of the Perth’s available sunlight, or solar access. As shown previously, the Sun rises earlier in the summer months than it does in the winter months, and its position in relation to the horizon (altitude) also changes throughout the year. Figure 4 & 5 shows the path of the Sun's movement, in relation to a house, during mid summer and mid winter. 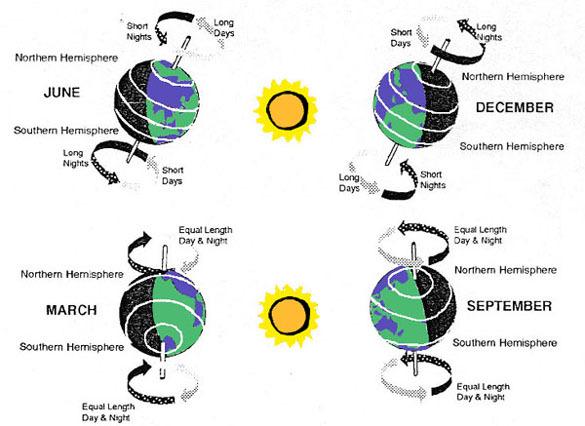 Figures 4 & 5 The Sun's movement in 4) mid summer and 5) mid winter. 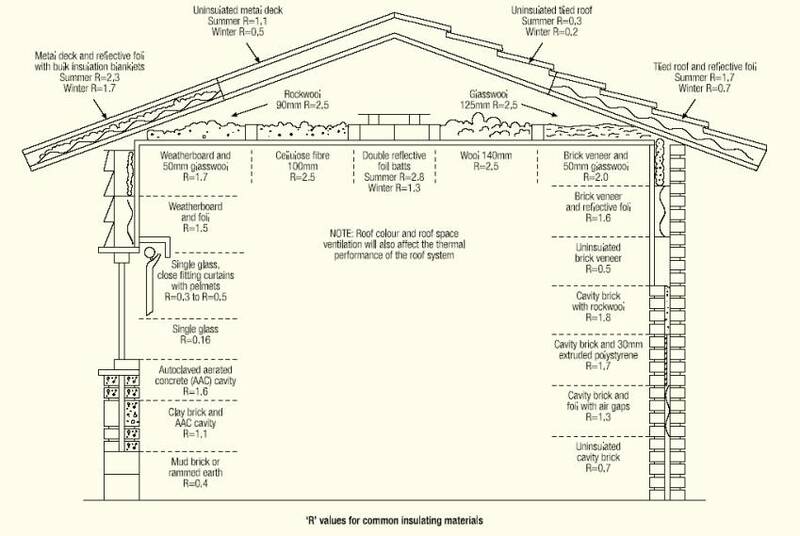 As can be seen in Figures 4 and 5, the majority of heat transfer occurs through the roof, as well as the west and east facing walls of the building. In contrast, during winter it is the north facing walls that are exposed to the most sunlight. Efficient houses use designs with good solar access and landscaping that takes advantage of the seasonal changes in the Sun's movement. 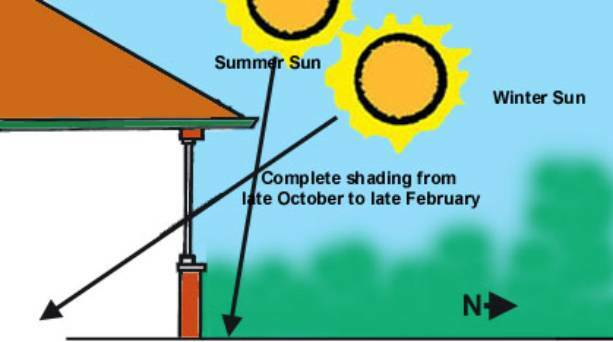 Whilst windows facing north are ideal, windows which are less than 20 degrees east or west of north will still allow the Sun to enter through them in winter, whilst excluding much of the summer Sun if your eaves are well designed as shown in Figure 6. Windows facing east or west are more difficult to shade during the summer months without the use of landscaping. South facing windows will lose heat during winter and gain some heat in the late afternoon and early evening during the summer months in temperate latitudes such as Perth. Figure 6 Eave design for north facing windows, which exclude summer Sun in the southern hemisphere. To calculate the ideal overhang required for eaves, multiply the distance from the eaves line to the base of the window by 0.4 for shading from October to February and 0.7 for shade from September to March. The building envelope is a term used to describe the external and internal walls, roof and ceiling, windows, floors and general room layout in a home. This envelope controls the majority of heat gain in summer and heat loss in winter. Efficient building envelopes collect and store heat and light from the Sun in winter, and in summer excludes the Sun and facilitates the cooling transfer of air. Efficiently designing the building envelope for Perth’s climate assists in creating a comfortable living environment for the human body throughout the year. Climate sensible design makes use of the natural energy flow in our environment to heat and cool our homes. This eliminates the need for expensive active mechanical heating and cooling. Solar heating and cooling is designed to keep the summer Sun out, and let the winter Sun into your home. This requires solar energy to be collected, stored, distributed and controlled during the course of the day. Figure 7 below is one such energy efficient house, designed for a temperature zone. Looking and costing the same as conventional houses, this house is more comfortable to live in and is cheaper to run. To see the Greenhouse Offices Technical Manual about this house click here. 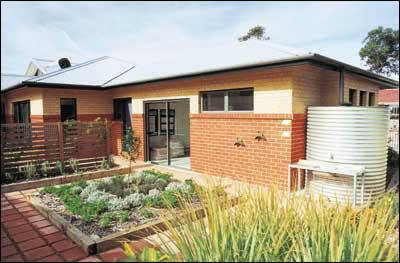 Figure 7 An energy efficient home (courtesy of the Australian Greenhouse Office). Controlling the energy flow in buildings requires an understanding of what is known as “thermal mass”. Thermal mass is a term to describe solid materials like bricks, concrete, stone, and any other masonry that can collect, absorb, store and emit heat. This regulates the temperature inside the house, as the heat from the day is stored in the thermal mass and is re-emitted during the night. Therefore, decreasing thermal extremes in houses increases the thermal comfort and avoids the need for much mechanical cooling and heating. The amount of thermal mass needed is dependent on the climate, and choosing a thermal mass design inappropriate for the climate will result in an inefficient building envelope. Passively designed homes can look like any other home, but efficiently regulate natural energy flows to regulate the homes internal environment, creating a more comfortable home that is less expensive to run. The areas of glass, walls and roof are important. The insulation rating of roof and walls as well as how the shade is used in summer, all play a part in the success of a passive solar home. Science allows us to calculate the effect so that decisions can be based on reality, rather than speculation (see Figure 8). Figure 8 Losing and gaining heat in a house at different times of the year (courtesy of the Australian Greenhouse Office). 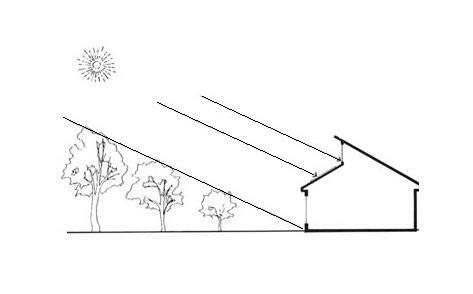 Passive solar houses need to have a balance. It is possible to gain more heat in winter than is lost during the day, and conversely, in summer lose more heat at night than is built up during the day. Increasing the amount of thermal mass in a house assists the regulation of internal temperatures, and a simple method of increasing the amount of thermal mass in a house is using concrete slabs. Concrete slabs in the ground are desirable for all but tropical climates. This is because of the continually high ground temperatures in tropical regions. Under floor insulation, or slab edge insulation, can allow this valuable contribution to thermal mass in hotter and cooler climates. Use of solid walls internally, which are interactive and connected to the earth by earth beams or subterranean structures, can also enhance the thermal mass effect and allow the structure to follow the deep earth temperatures of the region. This is because, in most temperate regions, the deep earth temperature is 18 – 20 degrees all year round. To make the best use of your solar access, entertaining and living areas, which are used during the day, should be on the north side of the house, with rooms which are used less often such as bathrooms and bedrooms facing south. 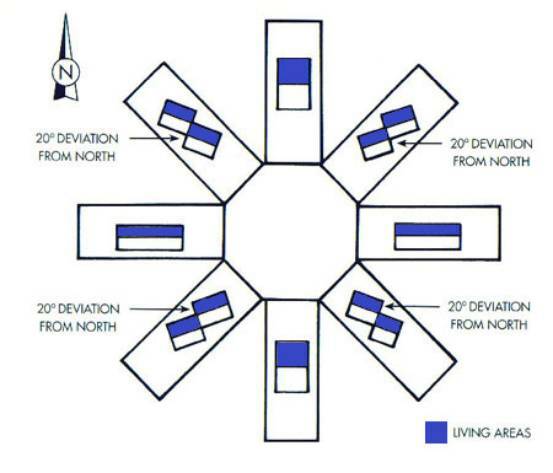 As very few blocks in Perth are orientated along compass direction, a number of different plan layouts for the differing block orientations are available (Figure 9). As a rule of thumb for houses in Perth, optimum energy efficiency is obtained when north and south facing walls are between 1.5 and 2 times longer than the east and west facing walls. 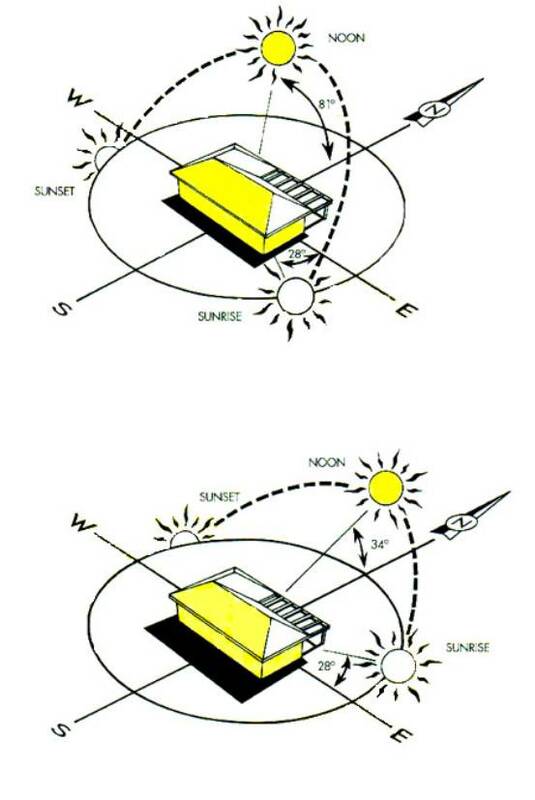 Figure 9 Possible house designs giving good solar access on blocks with varying orientations. Insulation consists of materials that reduce the flow of energy through the surfaces of buildings. This includes materials to reduce both conduction and radiation of energy. Without insulation, the energy flow in buildings would usually be too great to maintain comfortable conditions by passive means - that is, without the use of mechanical devices for heating and cooling. Thermal resistance (R) is a measure of the effectiveness of the insulating material. The larger the "R - value" of a material, the better. Figure 10 shows the R - value of most common building materials (R - values are measured in SI (Standard International) units as Km2/W, (or the number of Watts that will be lost per square metre at a given temperature in Kelvin). For the purpose of calculation of total energy transfer, the reciprocal of the thermal resistance is used. This is the "U - value", or thermal conductance, and is measured in W/Km2. The smaller the U – value, the larger the R - value. The optimum thickness of insulation will depend on a number of factors. It is difficult to attain comfortable conditions with a passive design if the total energy flow through the walls or ceilings exceeds about 5 W/m2 for any extended period. This would be the case for example, if the temperature difference across the insulated surface is 10° C, with less than R2 (U= 0.5) insulation. 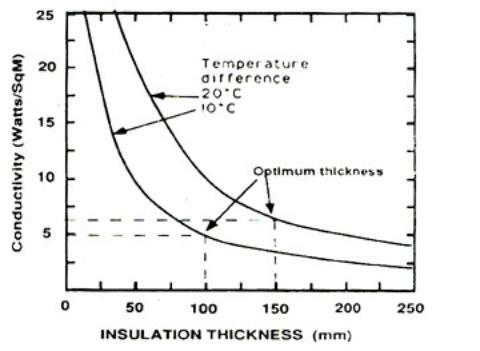 Figure 10 The optimum thickness of insulation depends on the temperature differences involved. 100mm of bulk insulations (R2) is adequate if the temperature difference is about 10°C. If the temperature difference is 20°C (such as on an unshaded west wall or under a dark coloured roof), then the extra insulation is required for an acceptable heat transfer rate. Figure 10 shows that there is little benefit from insulation thickness greater than 100 mm with a 10°C temperature difference. At this thickness, the energy flow is reduced to about 25% of that of an uninsulated wall or ceiling. Sustained temperature differences of 20°C or more usually occur in summer in unventilated, low-pitched dark coloured roofs, or dark coloured unshaded west facing walls. The optimum thickness of insulation will also depend on the cost of energy if active heating or cooling is used (e.g. electric, gas or wood heating in winter and air-conditioning in summer). The cost of the extra thickness of insulation should then be balanced against the reduced cost of heating or cooling. Again, the benefit of extra insulation diminishes rapidly beyond a certain point. For example, it would cost about $12 a day to heat a 150m2 uninsulated double brick and tile house in Perth. If this house has R2 insulation in the ceiling and walls as well as heavy curtains, the heating cost would be reduced to about $4. By doubling all of the insulation (if it were possible) the cost would be reduced to about $2. Therefore, doubling the insulation cost only provides a further 17% reduction in heating costs. However, there are practical limitations to the thickness of wall insulations, window insulation and reduction in air change rates. Figure 11 Winter versus summer R values (courtesy of SEDO). It can be seen from Figure 11 that different R-values are quoted for the same materials in summer and in winter. This is because the total heat transfer depends on whether the energy is flowing into or out of the house. In summer, when it is hotter outside than inside, highly reflective surfaces, such as foil, aluminium paint and light coloured roofing materials will help to reduce the radiant heat gains. Also, because warm air rises there will be a thicker air film underneath the ceiling, thereby increasing the bulk insulation values. In winter when the inside of the house is warmer, reflecting surfaces on or underneath the roof will do little to prevent energy from being transferred through the ceiling. Any warm air on top of the ceiling is free to escape, and will not provide the same insulating air film thickness as in summer. The insulating properties of the various fibrous (bulk) insulating materials are similar. All commercially available materials have appropriate government approvals for health issues, including flammability. As some local authorities have by-laws that prohibit the use of some materials in walls, you should check with the local planning authority, before installing wall insulation. Other than these provisos, the criteria for the selection should be practicality, personal preference and price. For example, it is generally not practical to install loose fill insulation in raked (sloping) ceilings, as it will tend to settle towards the bottom of the slope leaving uninsulated areas. Some loose fill is also unsatisfactory in ceilings with open eaves, as draughts tend to blow it around. Some people prefer recycled or natural products such as wool fibre, cellulose fibre or seagrass. However, no health hazards have been demonstrated to be associated with fibreglass batts or rockwool. The insulation industry in Australia is highly competitive, so prices will vary. The homeowner should make an accurate analysis of the actual area of insulation to be applied, to ensure that the price comparisons are meaningful. Thermal conduction occurs when the more rapidly vibrating hotter molecules collide with cooler, more slowly vibrating molecules, thereby transferring energy from hot to cold regions. In all cases, thermal conduction increases directly with increasing temperature difference between the hot and cold side of the material. The thermal conductivity of a material depends on its density, the size of the molecules in the material, its electrical conductivity, and its thickness. Metals are relatively good thermal conductors, and gases poor conductors, with masonry, wood, glass, plastics as well as natural fibres in between these two extremes. In practice, the insulating ability of many building materials is mainly due to the thickness of still air that is in, or around, the material. For example, about three quarters of the R - value of a double brick wall is due to the air films on the surfaces of the bricks. With single glass windows, this figure is about 90%. Many of the bulk (fibrous) types of insulation have similar R - values for the same thickness, at about R2 for 100 mm of insulating material. This is due mainly to air which is a poor conductor being trapped in pockets surrounding the fibres. The reduction of thermal conduction by bulk insulation should not be confused with the reduction due to the reflection of radiation from surfaces. Shiny metal surfaces are generally good reflectors of all wavelengths of radiation, and when hot, they will not re-radiate energy as readily as most non-metallic surfaces. The combination of heat reflection and low re-radiation makes reflective foils effective insulators, particularly in places such as roofs where there is incident solar radiation. Reflective foil will reduce the amount of energy transferred by radiation. However, it will not reduce the conductive heat transfer except for the air films that are created on its surfaces. Figure 12 Reduction in roof temperatures with and without reflective coatings (courtesy of Lawrence Berkeley National Laboratory). White, or other very light coloured paints, are effective in reflecting incident solar radiation. However, they will not reduce re-radiation in the same way as shiny metallic surfaces. They will also not change the way energy is conducted through that surface. For example, a white painted galvanised iron roof will reflect away about 90% of the incident solar radiation. This will keep the outer surface cool, and thereby reduce the total energy being transferred into the building (see Figure 12). However, it will not change the conductivity of the galvanised iron itself, which will still let heat escape readily in winter. Your Home’s Home Technical Manual – Australia’s Guide to Environmentally Sustainable Homes, is a large resource with many areas of house designs covered, including; Passive Design, Water Use, Materials Use, Energy Use etc. The Government of Western Australia Office of Energy has an excellent range of information on reducing household energy use in WA. The Energy Smart Homes website is a good source of information. The Office of Energy also has various publications. The Australian Standard AS2627.1 Part 1 "Thermal Insulation of Dwellings - Thermal insulation of roof/ceiling and walls in dwellings" contains recommendations for R-values for dwellings that are to be heated in winter (there are other Australian Standards for thermal insulation associated materials). Most commercial brochures now indicate the thermal performance of the product.